The study aimed at specifying the involvement of rural youth in agricultural activities. The rural youth were actively involved in production and marketing activities bit empirical data to support it was lacking on their participation. The study has been conducted on a sample of 120 rural youth who were already engaged in agriculture from randomly selected six village of Ludhiana district. The data was collected through personal interview schedule. The interview schedule composed of two parts: one for personal characteristics and, the second, information about their involvement in agricultural activities in different crops. The schedule consisted of common field activities. Against each activity, it was designed to obtain responses as fully involved, partially involved/supervised and not involved. The scoring pattern was 3, 2, and 1 for fully involved, partially involved/supervised and not involved. The results revealed that the majority of the respondents were either fully involved or partially involved with regard to common agricultural activities of land preparation. Majority the respondents were fully participated in most of the major activities such as variety selection, sowing and marketing in all crops that were grown by them except in transplanting in case of paddy where they were partially involved. Again majority of them were partially involved in harvesting, disease and pest management and fertilization. 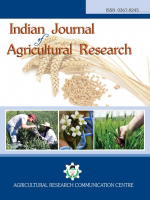 Education and extension participation involvement in the cultivation of fodder were found to be positively correlated. Family type, Farming experience, Operational land holding and Extension participation were significantly and positively co-related with the involvement in summer moong, potatoes and berseem. Agricultural Activities, Cultivation, Involvement, Marketing, Production, Rural Youth.